It took a lot of hunting around before I was able to figure out the correct setup. I’m writing this up to save other the effort of having to pull together all the pieces of the puzzle. The way I used to have everything set up was using multiple mail accounts. One was my official Gmail account, and the others had fake incoming e-mail settings and Gmail as outgoing. This worked pretty well except for the occasional error from the Mail app about not being able to contact the incoming server. The big issue was replying to an e-mail sent to one of my non-Gmail accounts. iOS always replied using the address associated with the inbox which was always my Gmail address. I almost never use it so every time I would have to select one of my other accounts. 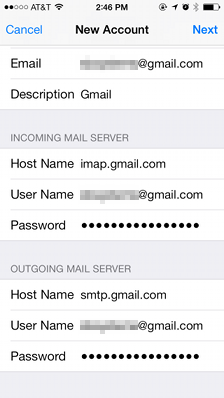 These alternate addresses are actually supported by iOS, but not through the Gmail account type. 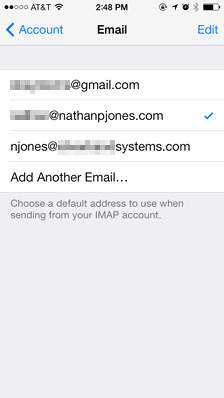 The trick is in setting it up as a regular IMAP account. Edit 9/2016: Note for TFA Users – Before you continue, a quick note if you’re using two-factor authentication of some sort. Since these instructions don’t use the standard Gmail account type, you won’t be prompted to enter your second factor code. For situations like this, Google allows you to set up what they call an “application password”. Note this down and use the password for for ALL passwords during setup of this account. Edit 9/2016: Note on Allowed Aliases – One other thing to note is that Gmail will actively prevent you from sending e-mail through accounts that it doesn’t know. After all, you could be sending spam. 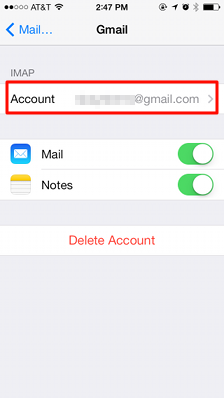 You have to add the account through Gmail Settings -> Accounts and Import -> Send mail as:. That’s outside the scope of this guide, but there are plenty of guides out there including Google’s documentation. Bottom line is if you can use the alias addresses in Gmail’s web client then you can use it for the instructions below. Here are the steps. This works the same whether you’re using the iPhone or iPad, but I’ve included screenshots from setting it up on an iPhone. 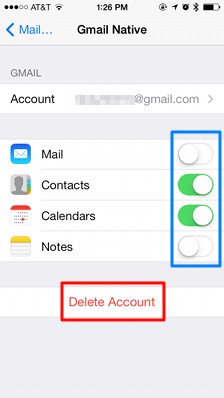 If you already have a Gmail account added, you have two choices. 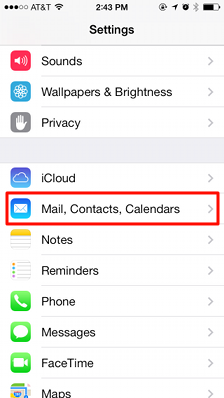 The account we are going to add wont’ sync calendar or contacts so you can select only these to sync (blue box) or you can just delete the account (red box). Enter your name, full Gmail address, password, and give the account some sort of description. When you click Next, your account will authorize with Google and then you can change more settings. Choose to sync Mail. (I sync Notes here as well.) Now click Save. Your new Gmail account is now listed among your accounts. Touch it to open it up and touch Account to access its settings. Once you’ve added your addresses, you can choose one of them for the default, indicated by the blue check ( ). 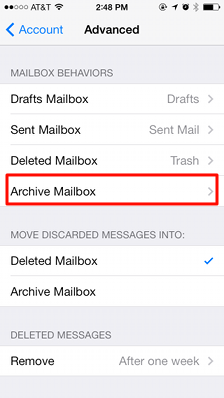 (Optional) The last thing is to do is set mail to be archived instead of deleted. Back at the Account page, touch Advanced. 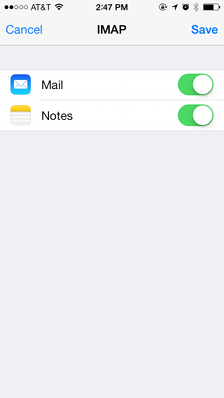 Touch Mailbox Behaviors: Archive Mailbox. Look for the “[Gmail]” folder and touch “All Mail”. 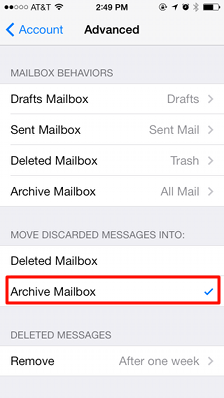 Back at the Advanced screen, touch Move Discarded Messages Into: Archive Mailbox. And that’s it. Your aliases will work without a problem. Feel free to leave questions or suggestions in the comments section. 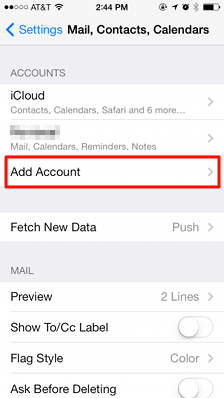 This entry was posted in Guides and tagged email alias, Gmail, iOS 7, iPad, iPhone, tips. I followed your exact instructions but Gmail doesn’t work, it sats something is wrong with imap. I triple-checked the settings, they seem to be correct. But my Gmail box is empty, and i can’t send or teceive messages. Any suggestions? at October 4, 2015 at 8:15 am. Does anyone has an idea how that problem can be solved. I suppose that Gmail verifications steps may be are the cause. When I follow the steps on top of this tutorial I come up to step 7. My login is confirmed. With step 8 I faile. With exactly the same login data. I just restored my iDevice completly to a naked 9.2.1 and now I didn’t restored my old data of the backups. Than I followed the steps of the tutorial and everything worked fine immediately. I don’t use the two factor verification which gmail offers. 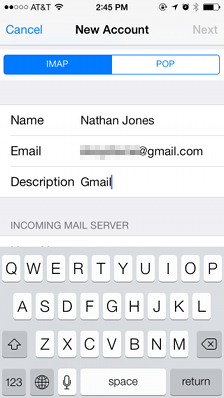 The configuration of the mail app works without such a verifikation. Just with the normal password of the gmail account. Something – I don’t know what – on my old system disturbs the mail account settings. I suppose it was some old secondary smtp server entries. They were disabled, but may be there are still some effects. It was my first time since years, that didn’t use my stored backup after an restore to a new iOS version. May be that “clean install” solved the problem. Similar problem to Victor I think. Someone just tried to sign in to your Google Account from an app that doesn’t meet modern security standards. 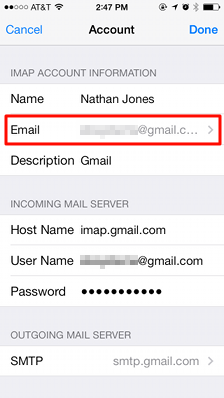 A helpful note regarding INCORRECT imap and smtp passwords: If you have 2-step verification for your Gmail account, you DO need to generate an app-specific password for this set up. 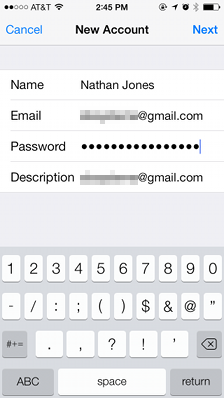 Go to google’s 2-step verification and set up an app-specific password for Mail on Mobile. I followed your detailed instructions and it works great, Thank you! 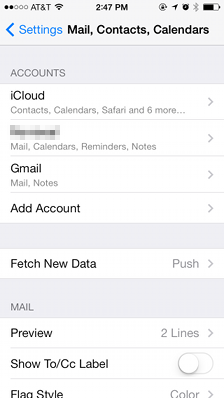 im google apps user theres any way i can get my emails with push to my iphone when using your method? Thanks for posting this. works great. 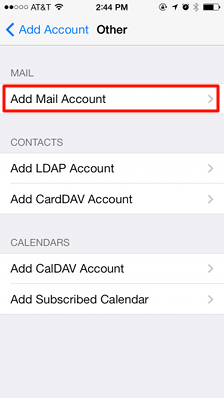 One thing to check though: This way I seem to get different (or at least differently named) mail folders on IOS. 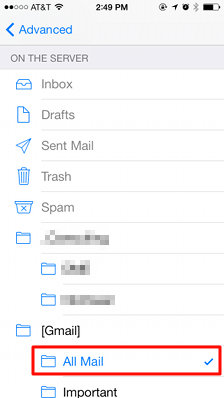 I don’t see “all mail” and “[GMAIL]” with important beneath. is that correct? Cant use this setup on iphone 6 plus, using google apps for work. 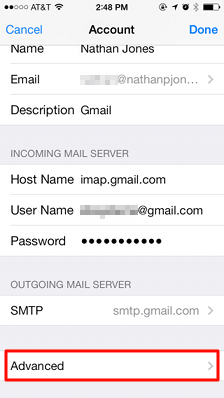 ios 9.3.2 keep getting the message that the user name or password for imap.gmal.com is not correct. You’ve left out one important step! Once you enter the new address you must hit return in order to save it. THEN you can select either one as a default by selecting it to move the blue checkmark. This might be obvious if adding multiple addresses, but when adding only a second one, as I did, it was not. I added the address and as there was no save, backed out of the settings and the new address never remained. Simple yes, but perhaps not obvious. If you’re going to write guides like these, don’t leave out ANY steps. Hi This does work exactly as it says with one caveat. I cant send a photo by email. If i set up the account using the Gmail entry tab I can send photos but I cant change the alias!! Hi all, I struggle a lot to make this work as described. I also needed to log into the account online (web interface gmail admin) and add the alias on the account, without this step I was NOT able to see the outcoming mails as per my alias. E.g. myusername@mydomain1.com all mails where showing this instead of myalias@myseconddomain.net (my alias is under a different domain which is in google apps (free)). Thank you so much nathanjones and the others people comments! I’ve being around this issue (alias) almost all day long. It’s now working perfectly. and that error of the wrong password will finish. With this setup I can choose alias and send photos and/or attachments from my dropbox location. Hope it comes working correctly now to you too. I really thought the use less secure apps was the answer but no! 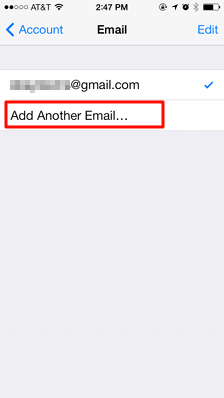 I simply cannot send an attachment via the iOS email app set up for gmail using an alias. If I change the from field to my gmail address it sends! So infuriating. this nearly has done it for me. The only question I still have. What am I todo with the contacts. I really need my contacts to sync as well. This is driving me madd. Lool. I am using a uchicago.edu email account through the UChicago google apps (which I assume is similar to other university gmail apps). These instructions do not work in that case. I on the Step 8 I get the “the user name or password for imap.gmail.com is incorrect” error message. The google app doesn’t allow 2-step verification, so I don’t think that is the issue. Has anyone else got this to work in the case of an .edu google account? Did you confirm that SSL was on? That was the problem for me. Thanks, Dude. Very helpful indeed. I’m getting the same error message saying that my imap password is incorrect. Is there any way to get this to work when you have two-step verification without having to allow less secure apps? So I have a domain email (Domain 1) that I own but have all my emails from it forwarded to a Gmail email. I can then reply or send new messages on the gmail and the person I sent the email to receives it from the Domain 1 email. It works perfectly online for me. When I try it with the steps above to get it to work on my iphone it works perfectly until Step 12. It won’t let me hit return and save the new email address. I notice above it mentions “Remember these have to be preauthorized by Google” My email must not be preauthorised by Google. How do I get around this? Any suggestions, I would be most grateful. Awesome – thanks for this. I have tripple checked what you said to do. I have TFA set up, but I used the special passcode I set up through google for this as you say at the start of the post. Many thanks for this. It was driving me crazy. With Apple Mail on my Mac I realised I could also follow your advice and simply add a comma next to the g-mail address I was sending from to add more. Much cleaner and neater than having multiple email accounts, some of which were being blocked by the outgoing mailserver and defaulting to an email address I didn’t want the mail sent from. And to Glen who pointed out the not-so-obvious (to me at any rate): thanks for the heads-up on pressing enter after you’ve added the the email address. I don’t quite get why one would archive discarded messages, but I followed your instructions anyway. A big thank you for the tip! You saved me valuable time. I was hopeless and had this problem for so long, but now I can use my alias account too as an option to reply to emails. 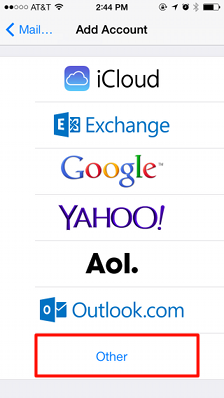 Only difference is that I use outlook and not gmail! It seems that it works for any email provider as long as the configurations are correct.